Themes of my professional work include professional development, equity, preservice mathematics methods courses, and rational numbers. I have conducted research on the effective teaching of rational numbers and on mathematics teacher enhancement activities aimed at assisting teachers to focus on children's thinking and to help all students succeed in mathematics. My current interests lie in (1) developing and conducting professional development to support teachers in enhancing their teaching to help all students succeed in mathematics and (2) developing programs for Elementary Mathematics Specialists. Cathcart, W. G., Pothier, Y. M., Vance, J. H., & Bezuk, N. S. (2015). 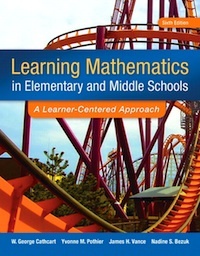 Learning mathematics in elementary and middle school: A learner-centered approach (6th ed.). Boston: Pearson. Bezuk, N. S. (2008). The impact of mathematics professional development on primary-grade teachers' understanding of geometry: A preliminary report. In Proceedings of the 2008 Hawaii International Conference on Education. Honolulu, HI, 344 – 355. Carlsson, G., Cohen, R. L., Clements, D. M., Malloy, C. E., Moseley, L. G., Silbey, R. R., & Bezuk, N.S. (2001). McGraw-Hill Mathematics (grades K - 6). New York: McGraw-Hill. Curcio, F. & Bezuk, N. S. (1994). Understanding rational numbers and proportions. F. Curcio (series Ed. ), NCTM Curriculum and Evaluation Standards Addenda Project—Middle school volume. Reston, VA: National Council of Teachers of Mathematics. Bezuk, N. S. & Bieck, M. (1993). Current research on rational numbers and common fractions: Summary and implications for teachers. In D. T. Owens (Ed. ), Research ideas for the classroom—Middle grades mathematics (chapter 7, pp. 118 - 136). New York: Macmillan.